From the President – Have an active October with Audubon! ASM Meeting: Technically, this happened on September 28-30, but I hope that many Columbians took advantage of this opportunity to show off our favorite local birding hotspots (and maybe find some new ones) in the company of friendly, expert birders from across the state. The meeting offered presentations on Friday and Saturday night, and a keynote speaker and banquet Saturday night, but especially featured a wide variety of birding field trips throughout the weekend. Columbia Wilderness Sanctuary: On Tuesday morning, October 2, Edge Wade will lead a field trip to a hidden gem in the middle of Columbia on the banks of Hinkson Creek. This area is largely unknown except to the neighbors, but it’s likely to be in the news this fall, as the city plans to construct a new segment of the citywide trail network through this area. Contact Edge Wade for more information. Band with Nature: This three-day event (October 8th, 10th, and 12th) is CAS’s biggest education initiative, and volunteers get a chance to share as hundreds of area second-graders experienced the wonder of birds up close and personal (read about last year’s event here). Contact Bill Mees if you’re interested in volunteering for a morning, an afternoon, or both. 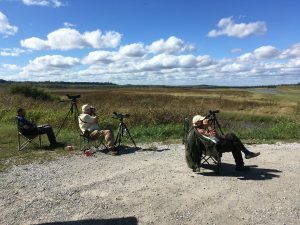 ‘Big Sit’ at Eagle Bluffs: This is a relatively new type of field trip for Columbia Audubon, and it’s the October event I’m looking forward to the most. The idea of a Big Sit, as popularized by the magazine Birdwatchers Digest, is to see as many birds from one location as possible during one calendar day. This is a group event, and you can spend as much or as little time at the site as you want. Our Big Sit will happen on Sunday, October 14 at the cul-de-sac at the end of the road at Eagle Bluffs Conservation Area. This spot offers great views of a variety of bird habitats, including the open marsh of pool 14, mature riparian forest on the banks of the Big Muddy, and the picturesque limestone bluffs along Perche Creek. During last year’s inaugural event, favorable winds along the bluffs led to a parade of Peregrine Falcons cruising south past the site — our group saw 18 on the day! Contact Eric Wood for more information. The pace slows down a bit in the second half of October, but we will still have plenty to do. Our October chapter meeting will be held at the Unitarian Church at 7:00 p.m. on October 17. Allison Vaughn, CAS board member and land steward for the Missouri DNR’s State Parks division, will share some of her extensive knowledge of birds and bird habitats in Missouri state parks. The last event on our October calendar is a field trip to Rocky Fork Lakes Conservation Area on Saturday October 20, led by Greg Leonard, one of Columbia’s best birders and a new member of the CAS Board of Directors. Check the Events calendar in the CHAT or on the CAS website (or contact the people listed above) to learn more about all these events. I hope I’ll see many of you at many of these October events! Former CAS president Kris Hagglund suffered multiple injuries in a zipline accident in his backyard over Labor Day Weekend. He spent one night in the hospital and is recovering well under Lori’s care, now spending partial days at his office. We wish him a full recovery in time to enjoy a planned birding trip to Belize in February, 2019. Lori says that good wishes are most welcome, but they’re getting along fine at this point. – Thanks to Edge Wade and Lori Hagglund for this notice. Official meeting minutes will be posted to the website after approval at each subsequent board meeting, meaning they are delayed from immediate publication. Minutes from the September board meeting were not available by publication time; please look for updated information in the October newsletter.